As we flew into Vancouver, the aerial view created a bit of onboard window seat envy. We were above what appeared to be infinite expanses of mountain peaks and forests occasionally dotted with winding rivers, lakes, and tiny dots of remote settlements. We were about to embark on an adventure that would take us from the excitement of a city to the splendor a vast wilderness of primordial forests, snow covered peaks, thundering waterfalls, shimmering glaciers, and crystal clear alpine waters. It was centuries after Columbus that colonial empires sent explorers to chart this region. They searched for a waterway that would connect the Atlantic and Pacific for trade with Asia. George Vancouver, a midshipman when Captain James Cook explored North America’s west coast in 1778, returned twelve years later with his own ship. He mapped much of British Columbia’s coastline, proving that there was no Northwest Passage through North America. He did, however, find that the area had much to offer. 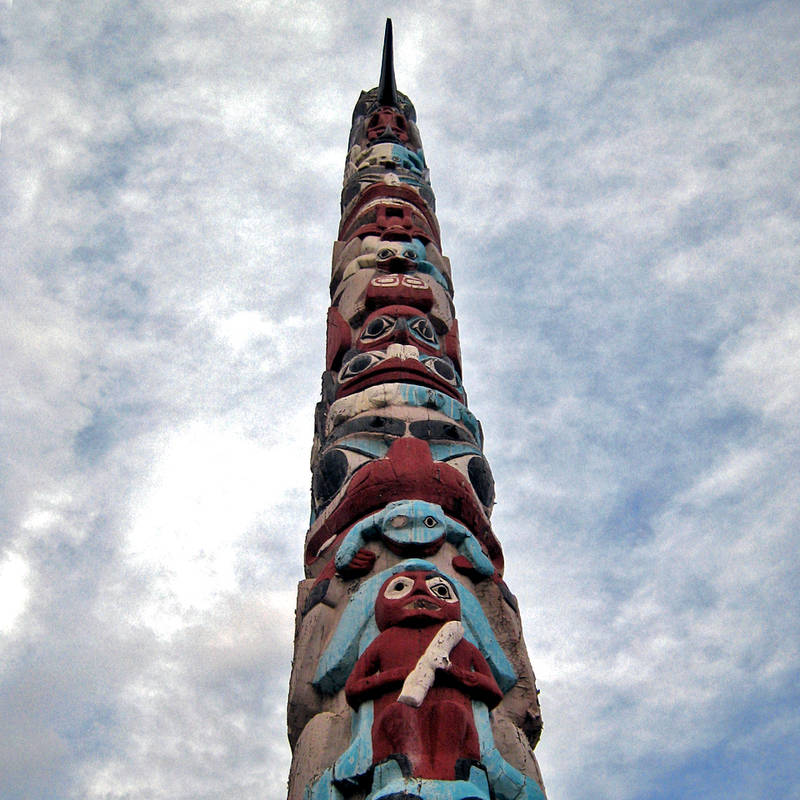 There were vast natural resources—timber and wildlife–and waterways to facilitate trade with the First Nation people who had hunted in this region for over 10,000 years. Pelts used in making the beaver felt hats that were so fashionable in Europe commanded a high price. Trading posts sprung up throughout the region. The discovery of gold in the Fraser River Valley and the Klondike Gold Rush in the Yukon quickly attracted more settlers. The prospect of laying claim to the western wilderness and creating new markets led to unprecedented expansion into this region. The Industrial Revolution was underway, facilitated by a low-cost immigrant labor force. Entrepreneurs and pioneers were ready to seize this opportunity. The race was for a transcontinental railroad that would link the coasts became so intense that at times competitors laid tracks side-by-side. Canadian Pacific Railway led the way with a line from Ontario to a western terminus (1881-1885) that became the City of Vancouver, incorporated in 1886. This would soon be the first transcontinental railway. Canadian Northern Railway established their own line in 1912. Grand Trunk Pacific Railway and National Continental followed with another in 1914. These three companies are now combined as the Canadian National Railway. The railway opened this vast and far-reaching territory to development, commerce, and affluent tourists. King George VI and Queen Elizabeth’s 1939 Royal Tour by rail, the first visit to Canada by a reigning sovereign, captivated the people and added glamour to this mode of travel. Railway officials knew that grand hotels were needed to attract the rich and famous, and built or acquired a group of properties across Canada that are now under the Fairmont name. Most were slate steep-roofed chateau style hotels resembling European palaces. Some, like Fairmont’s Empress in Victoria, were built in major cities for travelers boarding or leaving the train. 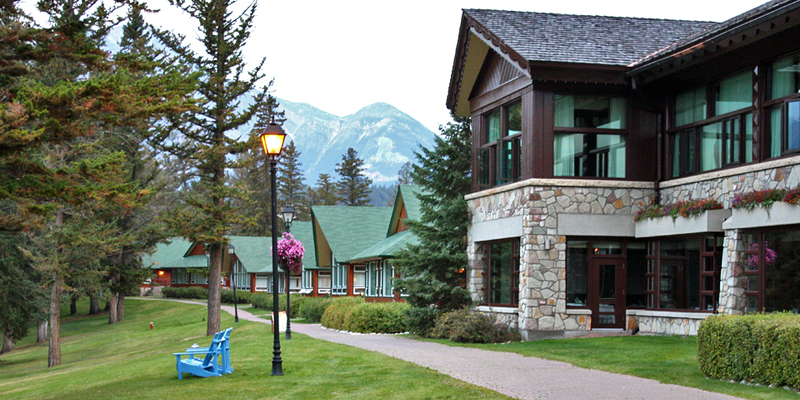 Others, like the Jasper Park Lodge, were destination hotels in scenic places like the Rockies. Grande dame hotels like these continue to be an integral part of a great train tour. 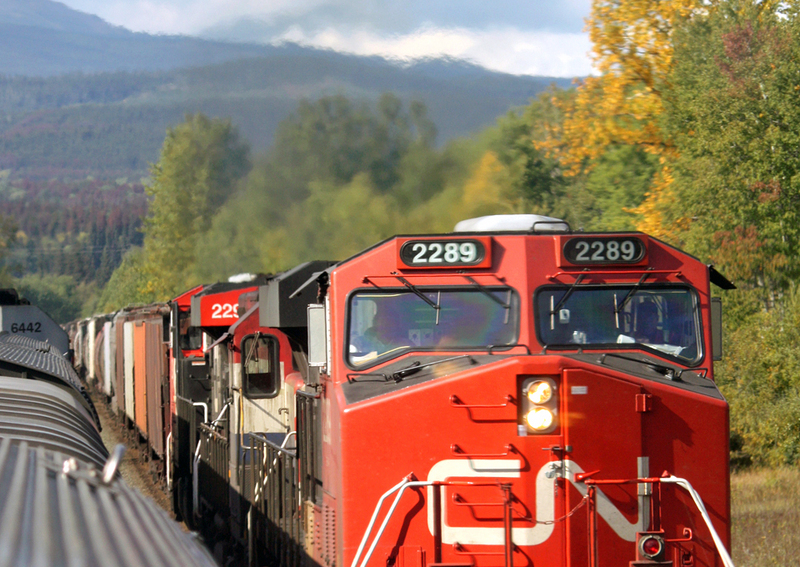 Canadian National’s passenger service is now a separate crown corporation known as VIA Rail. 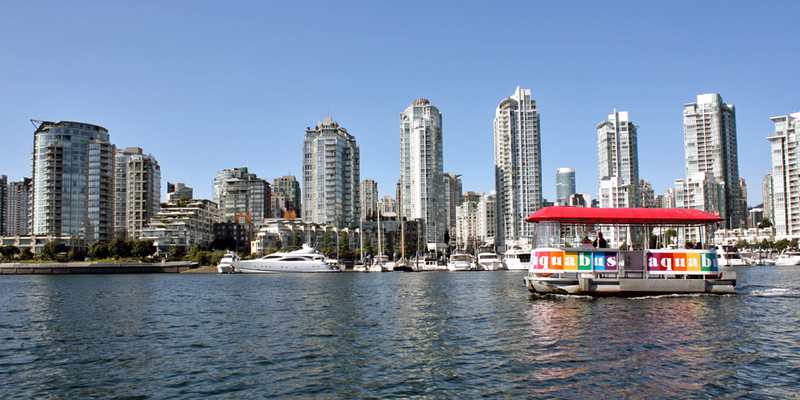 We boarded the first of our VIA (vee-ah) Rail trains, the flagship Canadian, in Vancouver. The complete three day Western Continental journey between Vancouver and Toronto passes through majestic Canadian Rockies, the sprawling prairie grasslands, and the lakes and forests of Northern Ontario. We disembarked in Jasper, Alberta, for a wilderness experience before boarding another scenic train, the Skeena, headed for Prince Rupert. Fares vary widely depending on category and comfort level of travel—from reclining coach seats to private rooms. Don’t let a limited budget keep you from experiencing this spectacular journey. Fares for the two-day journey from Vancouver to Jasper vary widely from the more economical Comfort Class to a Silver and Blue Class double bedroom. The Romance by Rail Package, a private suite with wine, flowers, and chocolates are also available. Check for specials including senior fares. 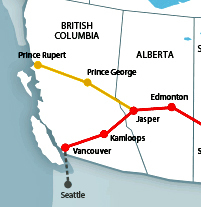 The Canadian route, shown in red above, offers an overnight rail experience with vintage appeal. It is a taste of the Golden Age of rail travel in classic stainless steel 1950-style passenger cars. To best enjoy this scenic route, we opted for Silver and Blue service. We were able to check our bags early and make the most of our departure day in Vancouver. The railroad theme began as soon as we arrived in the Silver and Blue lounge area to board the Canadian. Live music—toe-tappin’ tunes like Chattanooga Choo Choo—was accompanied by complimentary light refreshments. For those who couldn’t leave their email behind, there were two computers with wi-fi. The welcome aboard party with fellow passengers included hot appetizers and celebratory wine. Our sleeping compartment was dated but comfortable and included down duvets, a large picture window, private sink and toilet facilities, and access to a shower at the end of the car. Meals are part of Silver and Blue travel and are served in the dining car on china with crisp linens. During dinner the attendant turns down the beds so you can enjoy a quiet night, rocked to sleep by the rhythms of the rails. Also included is exclusive access to the upper observation decks of the Skyline car and Park car. 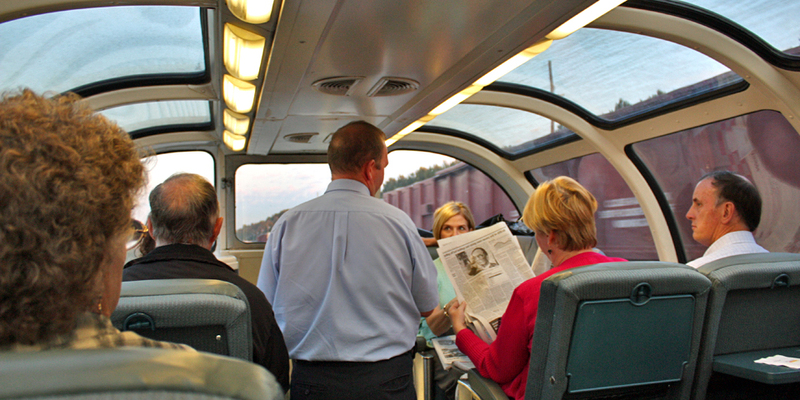 The Park car, at the end of the train, has 360° views, a lounge, 24 hour coffee and tea service, cookies and fresh fruit. We could stroll the aisles, meet fellow passengers in the lounge, marvel at the scenery, or simply relax in our private room. Adding to the experience is meeting fellow passengers from around the world. At dinner, where choices included Alberta beef and grilled regional fish, we discussed regional wines with a couple who own a vineyard in Australia. We compared Eastern and Western traditional breakfasts while sharing a table with a mother and daughter from Kyoto, Japan. The train winds like a snake around mountain curves, each revealing a new vista or a glimpse of history — mighty rivers, glacial lakes, tiny villages, lumber mills, or former Gold Rush boomtowns. A bear may scamper along the track. Our route took us by the longest river in British Columbia, the Fraser, which runs toward Vancouver from the Rockies near Mount Robson. Named for explorer Simon Fraser, it is known for rafting and salmon. The Cariboo Gold Rush was along this river, and folks still seek their fortune in places like Lytton’s Gold Panning Recreation Reserve. 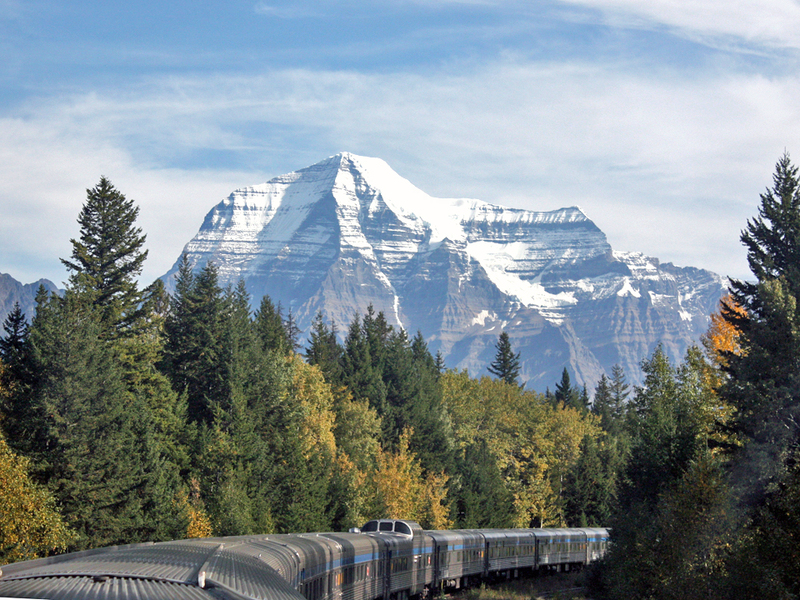 The train paused for photos of the highest peak, the magnificent Mount Robson, at 12,972’ the “Monarch of the Canadian Rockies”. The Robson Valley is part of the Rocky Mountain Trench, the longest valley in North America. At Yellowhead Pass we crossed the Continental Divide, mountain ridges that form the backbone of the Canadian Rockies. Water from this Great Divide flows toward the Atlantic or Arctic Ocean from the east side and to the Pacific Ocean from the west. Forests of Lodgepole Pines, with trunks like oversized telephone poles, soared toward the sky. These were used to support First Nations’ buffalo skin lodging and as railway ties for the transcontinental lines. We crossed the border between British Columbia and Alberta and changed our watches from Pacific to Mountain Time. We passed from Mount Robson Provincial Park to Jasper National Park, gateway to wilderness adventures, and the largest of Canada’s Rocky Mountain Parks. 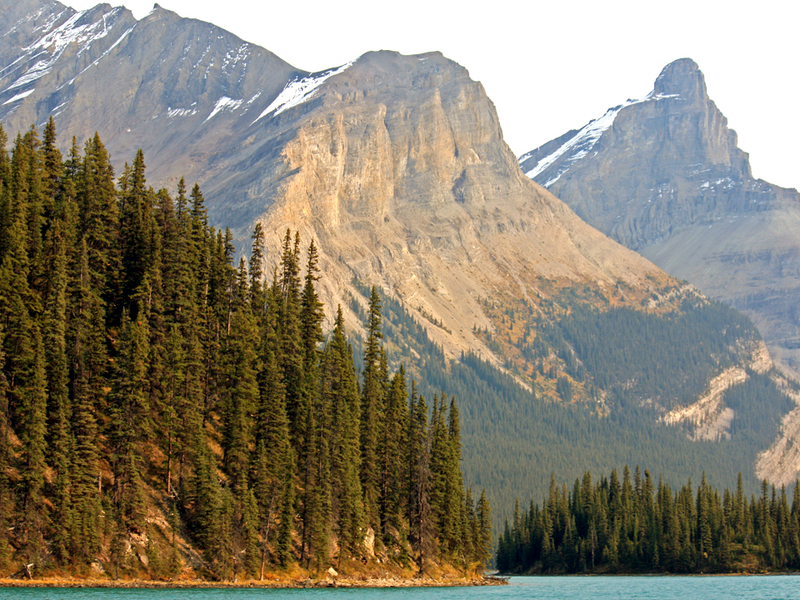 Local and international travelers are drawn to this mountain setting for outdoor recreation, natural wonders, and to view wildlife, including black bears, grizzly bears, moose, elk, bighorn sheep, and caribou. Jasper National Park is a UNESCO World Heritage Site covering 4,200 square miles and one of largest protected ecosystems in North America. It is an untamed, unspoiled wilderness with glacial blue mountain lakes, gushing waterfalls, lush valleys, and skies so clear that on cold, clear nights you might see the Northern Lights. The town of Jasper is within the national park in the relatively low altitude (3200’) of the Athabasca Valley. 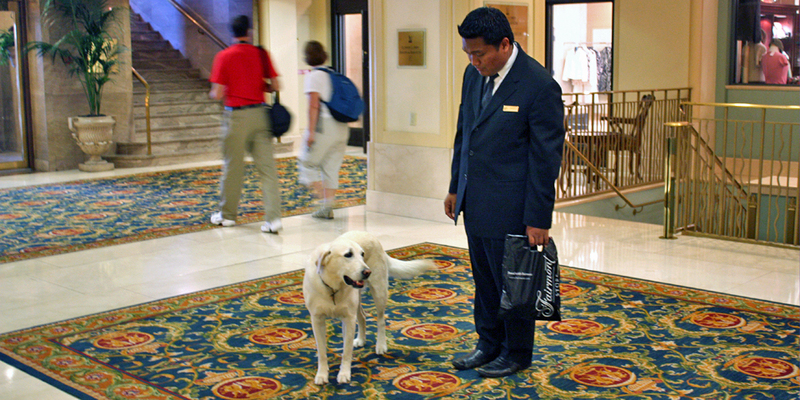 Foremost among accommodations is the year-round resort, The Fairmont Jasper Park Lodge. Along with the trains to Jasper National Park came tourism, and to create grand accommodations worthy of the rich and famous, Grand Trunk Railways bought a lakefront tent camp in 1923. 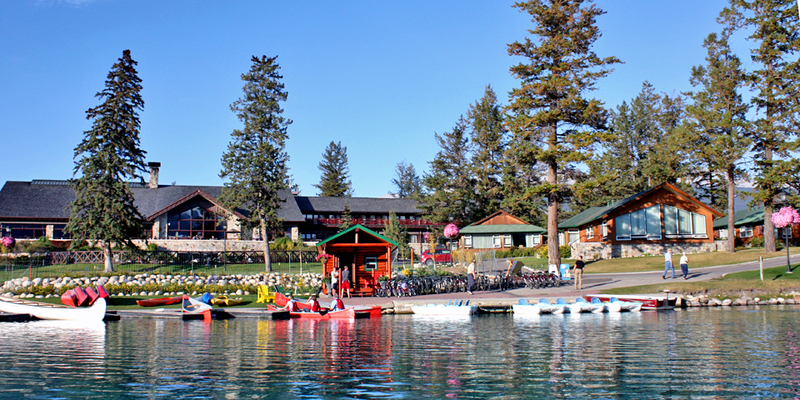 They called their first main lodge “the largest single story log structure in the world” and expanded over the years. The Fairmont Jasper Park Lodge is now a luxurious alpine village with cedar chalets and log cabins– 446 rooms on 903 acres–with year-round recreation, an award-winning golf course, and exceptional dining, rated 4 diamonds by AAA. Marilyn Monroe and Robert Mitchum stayed in Point Cabin while filming River of No Return. Bing Crosby and Dinah Shore played the golf course. Among other notable guests are Bill Gates, the Dixie Chicks, and the royal family. Outlook Cabin was chosen by King George VI and Queen Elizabeth during their Royal Tour in 1939 and for Queen Elizabeth II and Prince Philip’s visit in 2005, Alberta’s centennial year. Paddleboat, kayak, or canoe on Lac Beauvert. Ride the trails on horseback, by mountain bike, or on foot. Play golf, tennis, or lawn games. Get room service on a bicycle. Or simply enjoy the majestic mountain beauty from the comfort of an Adirondack chair. 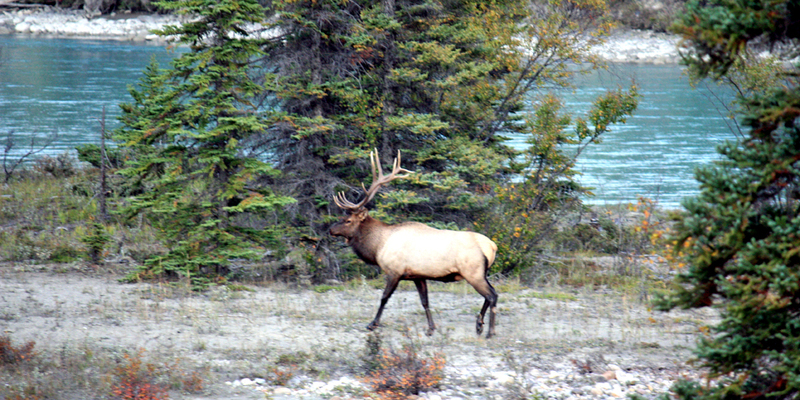 Visit, as we did, in rutting season, and you may awaken early to the sights and sounds of an elk buck to bugling to attract a mate. Winter brings sleigh rides and ice skating, dogsledding, snowshoeing, and downhill, cross-country, or heli-skiing. At the end of the day, relax over dinner in one of the restaurants, like the rustic-style Moose’s Nook, with a crackling log fire, native artwork, wildlife paintings, and live music and dancing. Outstanding cuisine is creatively presented using regional ingredients like fish from Great Canadian White North, aged Alberta beef, and bison. Jasper Tramway is Canada’s highest and longest aerial tramway– a narrated ride to the 7472’ high alpine tundra of Whistler’s Mountain. The view from the top is spectacular– six mountain ranges, glacially fed lakes and meandering rivers, and the town. The more adventurous may want to climb the summit hiking trail. 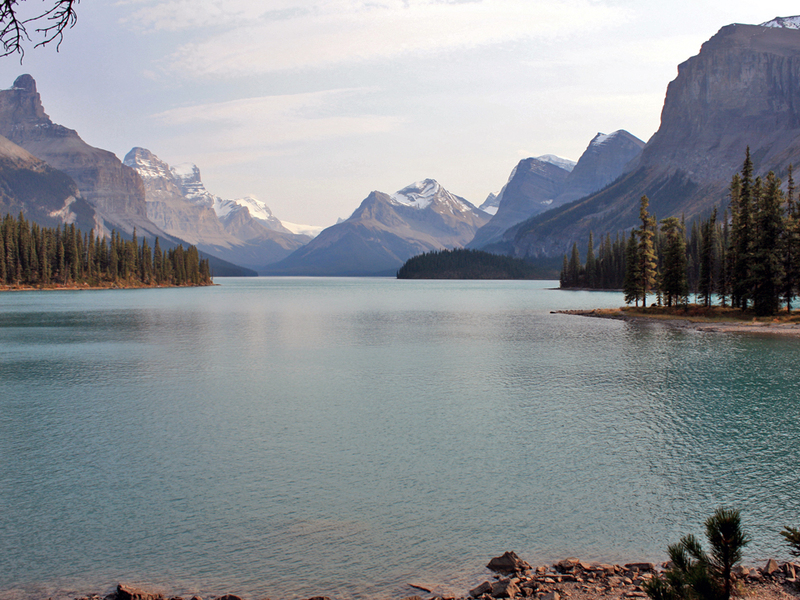 The glass enclosed boat tour on Maligne (mal-leen) Lake, the second largest glacial lake in the world, was named Best Cruise in Canada by Reader’s Digest in 2007. 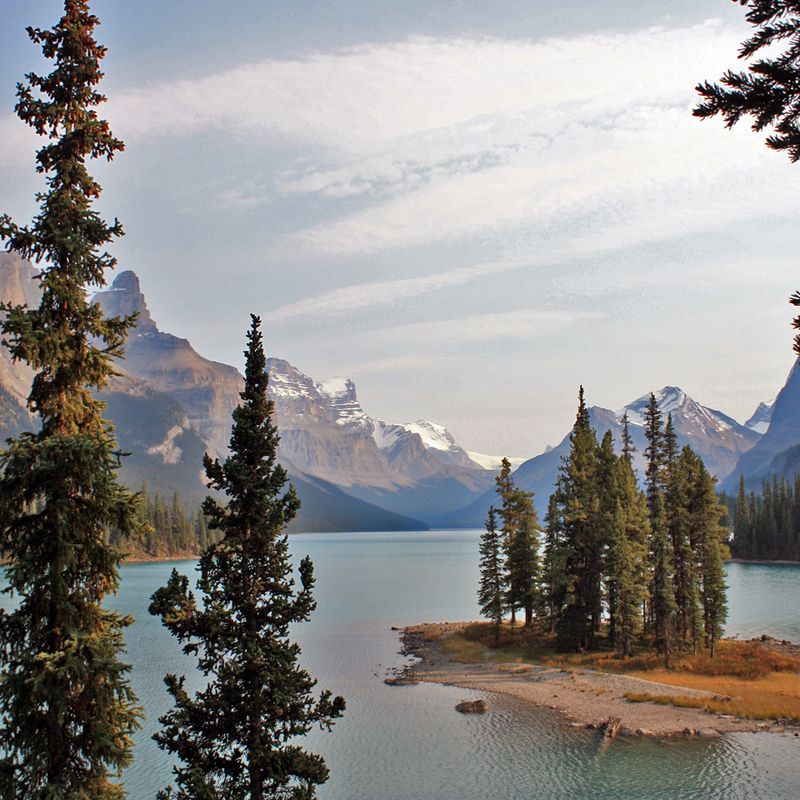 You’ll want to photograph the world-famous Canadian Rockies landmark, Spirit Island. Return to town past Medicine Lake. Legend has it that the wild seasonal fluctuations in water level—sometimes it even disappears —are caused by resident spirits. Columbia Icefield straddles the Great Divide and the Snow Dome, 11,330’ high rounded summit, is a hydrologic apex of North America. But visitors are best advised to beware the crevasses of Athabasca Glacier! The hop aboard a train for another great adventure like VIA Rail’s Skeena and BC Ferries.